Freelance writer Pauline Hovey spent several months corresponding with Jens Soering and then visited him in prison. This is the first of a two-part series. It has been said that it is in our suffering that we are closest to God. If this is true, it may explain Jens Soering's story. A published author, former scholar at the University of Virginia, and Catholic convert, Soering has been imprisoned for 19 years for a crime he claims he did not commit. He is currently serving two consecutive life sentences with little hope of ever being released (in 2001 the U.S. Supreme Court turned down his last appeal), yet he has found hope in what many would view as a hopeless situation. As a German citizen and son of a diplomat, Soering's case drew international attention in 1986 when, at the age of 19, he was convicted of killing his girlfriend's parents. Some, including a former Virginia deputy attorney general, believe his case was mishandled and the evidence inconclusive, yet he remains behind bars. During his imprisonment, he has suffered being absent at the deaths of both his parents, lost contact with his brother, been denied access to all publications in his native language and survived several dehumanizing experiences ? in short, endured the removal of much of his personal sense of identity. Yet, rather than become despondent, bitter or withdrawn, Soering has found healing through Catholicism and the practice of centering prayer ? a practice he calls "incredibly simple, but quite difficult." Soering has been a devout centering prayer practitioner since 2000 ? currently praying for at least two hours a day in 30-minute increments. He believes that following this modern adaptation of the ancient Christian contemplative practice of resting in God has helped him to empty himself, accept his cross and actually overcome the suffering one experiences when living in prison. In addition, it gives him a sense of well-being in a place that could easily be unbearable ? a place where two men, sometimes suffering from emotional or mental issues, are required to share a cell the size of a large closet. Soering admits that he has been fortunate in that every single cellmate he has had since beginning centering prayer has respected his need for quiet when praying. "That has to be Divine intervention, because I'm not entitled to get five years' worth of excellent cellmates," he says. For Soering, centering prayer "basically is listening to God . God already knows everything that's in our hearts, so it's kind of silly to tell Him," he says. Rather than tell God how we think things should go, Soering suggests just being quiet and listening. "When we do that, we begin the most exciting and challenging adventure of our lives." Soering's "adventure" is not one that others would covet, yet it has brought him to an amazing place that has allowed him to see that "everything in our lives is a gift, if one's eyes are open to the working of the Holy Spirit." Even a life in prison can be used for God's plan, he realizes. Because the transformative effect of centering prayer evolves into centering practice, Soering has sought ways to be of service in his limited environment. After his last appeal was denied, he was inspired to write a book, The Way of the Prisoner: Breaking the Chains of Self Through Centering Prayer and Centering Practice, a very personal account of his journey to God through centering prayer and a guide to those desiring to learn the practice. His book was published in 2003 by Lantern Books, through the assistance of Father Thomas Keating, one of three Trappist monks (along with Fathers William Meninger and Basil Pennington) well known for bringing the practice of centering prayer to the modern world. Soering sent Father Keating his completed manuscript. The monk not only read it, but he sent it to his own publisher and then began a lengthy correspondence with Soering about contemplative prayer that has turned into a friendship. Despite a busy speaking schedule, Father Keating, who lives at St. Benedict's Monastery in Snowmass, Colo., and has published books, audiotapes and videotapes on contemplative prayer, found time to visit Soering in prison. During their nearly three-hour visit, Father Keating spent some time in centering prayer with Soering. 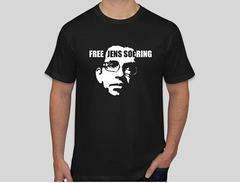 Father Keating calls Soering "deeply prayerful" and a "very compassionate man," both with the other prisoners and with the guards. Father Keating believes Soering is serving God through his writing, which often takes up the cause of prison reform. As both Soering and Father Keating will acknowledge, the present U.S. prison system is in opposition to Christ's message and needs overhauling. Soering has published numerous articles on prison reform and his second book, An Expensive Way to Make Bad People Worse: An Essay on Prison Reform from an Insider's Perspective, examines why the current system is failing, at an enormous cost to taxpayers. Father Keating recognizes that Soering is putting himself on the line by speaking out, but Soering doesn't seem too concerned. "My attitude is this," says Soering, "while I am in prison, I want to lead a life that is meaningful, a life of service to God and my fellow man . the writing comes out of the prayer." In addition to writing about prison reform, Soering has published thought-provoking spiritual articles in journals and national Catholic/Christian publications such as America, Pastoral Life, National Catholic Reporter and The Catholic Peace Voice. Remaining open to the Holy Spirit allows Soering to continue "to do my work, my writing, not without some fear and anxiety," he admits, "but with the underlying assurance and security that not my will but His is being done. So what does it matter if I feel a little afraid? That's just an emotional state, a passing phenomenon. What matters is that God is using me." It appears that God used Soering's intellect, his thirst for knowledge and his love of reading to bring him to Christianity and eventually to Catholicism. In the early 1990s, when the movie "The Last Temptation of Christ" spurred much controversy, Soering immediately ordered the original novel and, to his surprise, found the Jesus portrayed in this fictional story to be "a complex human being who suffered and doubted and struggled with his destiny, much as I had suffered and doubted and struggled with mine." He wanted to know more, so he began reading the New Testament. He fell in love with John's Gospel. Around the same time, he came across a national magazine containing photographs from NASA's Hubble Space Telescope. While gazing at the mysterious force evident in these photos, Soering said he experienced "a kind of epiphany," whereby he came to understand John's words that "God is love" through the existence of this "universal attractive force" in which "we live and move and have our being." Soering then sought the aid of a minister he had come to know and admire while in prison, the Rev. Beverly Cosby. Through Rev. Cosby's influence, himself a centering prayer practitioner, Soering read Henri Nouwen, Dietrich Bonhoeffer and Father Thomas Keating's books on centering prayer. During this process of reading and seeking he came across a Catholic Bible with marginal notes that appealed to his sharp intellect. His quest continued as he read Bible commentaries and the writings of Catholic theologians, which he found to be "truer" to the Scriptures than other writers he had come across. But it wasn't until the winter of 2000, when he experienced an especially "dark night" that he was truly ready to open himself and let the Holy Spirit in by actually practicing centering prayer. Sometime after beginning this practice, he was transferred to a medium-security prison, where for the first time he had access to religious services. His first encounter with a Catholic priest and the quiet beauty of the Mass resonated with his experience of the Holy Spirit during centering prayer and convinced him this was the right path for him. He eventually entered the RCIA program, with a Catholic inmate as his sponsor, and was received into the Church at Easter of 2002. Next week: The second part of this series looks at the positive impact Soering's Catholic faith and centering prayer practice are having inside prison walls.